This course builds up on the masonry course#2 and presents an introduction into the art of building dry walls using field stones without or with lime sealing. A major attraction of the Poitou-Charentes region in France are the many "dry walls" to be found on historic buildings. On the outside mostly protected by roughcast, they can in most cases be admired inside agricultural buildings. 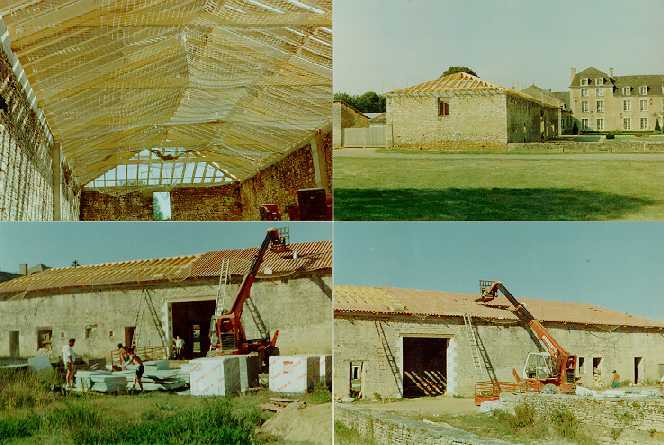 The following pictures were taken in the right wing commons building which has burned down in 1989. This building has been saved in extremis by covering it with a new roof in 1997/8. These walls are a fine example of early 18th century dry wall building using field stones. They show a regular pattern of stones with flat layers at distances of roughly 50 cm. On the left picture such a layer can be seen on the bottom of the opening and the next just above the third big stone (big - medium - big) on the left edge of the opening. Note that far bigger blocks are used to consolidate the opening. The interest of these walls stems from the fact that the patterns are sufficiently regular to give a harmonic impression, yet sufficiently irregular to be interesting and lively. The interstices between the stones are minimal and at least at the outer surfaces of the walls most of the forces are direct stone to stone forces. They are thus dry walls in spite of the fact that these walls are bound with earth. In the middle picture holes for former beams can be seen. In the right picture there is a problem area in the upper center due to excessive alignment of interstices. Practically all stones are lying in their natural horizontal position with the stone layers lying horizontal. Particularly lime stones as used in these walls are layered almost like pieces of wood. The stones must lie in the same position as in the mother rocks. Placing such stones in a vertical position would lead to cracks and erosion. Note the treatment of the large blocks in the right picture: their large and regular surfaces are made up by piles of up to three smaller stones making the bridge to the next block. All of the nice surfaces are turned towards the outsides of the wall. To a large extent they have been treated in a very rough way with a chisel. Towards the inside of the wall the fit of the stones of such walls is far less perfect (see pictures of lesson 3). It is essential that these walls contain keys made up of larger elongated blocks or large plates holding the two sides together. The treatment of corners and openings with large blocks is a further method to contribute to the stability. Very large and tall walls are often stabilized by columns of cut stones alternatively cut flat and large, and tall and narrow, respectively. The two following pictures show the effect of exposure to rain of such earth bound walls. These walls have collapsed after exposure of just a little over 5 years. Please note the large content of soil. This shows that this are true dry walls only on the surfaces. This is the reason why such walls often split in two halves when exposed to rain. They pose a great danger of course when ready to peel off. The lime stones of the Charente region in France take up water readily and are thus sensitive to cracking due to ice formation. This is probably the reason why most of the historic buildings in this region have roughcasts. Most of the inner walls of this building had indeed to be taken down as too much damaged by the fire and the rain. The inner walls are thinner and were thus far more damaged than the outer walls. The inner walls were also exposed to the fire on both sides and thus far more damaged. For this reason only two walls which were not touched by the fire could be left. All of the other inner walls had to be removed for static and safety reasons.